Under pressure from Reddit's administrators over copyright issues, the site's largest forum dedicated to piracy discussion has opted for "The Nuclear Option". After voting by its contributors, all posts older than six months are now being deleted. That's almost 10 years of data, the vast majority of it completely legal. The negative effects are already being felt. With around a quarter of a billion monthly users, Reddit is one of the most important sites on the Internet. The site plays host to millions of live discussions on countless topics ranging from the mundane to obviously controversial. 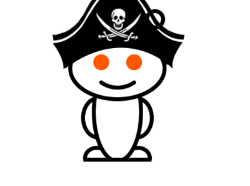 Recently we’ve reported on the troubles being faced by /r/piracy, Reddit’s most popular sub-Reddit focused on piracy discussion. In an article published mid-March 2019, we reported how the moderators of the forum were making best efforts to keep content on the right side of the law and within Reddit’s rules. Just a handful of days later, however, the moderators received notice from Reddit that they were receiving too many copyright complaints from rightsholders. For a sub-Reddit that has strict rules forbidding anyone posting links to infringing content, the notification came as a disappointment. While some complaints were legitimate (some people simply won’t abide by the rules and some posts do get missed), many were not. This placed the forum’s moderators between a rock and a hard place. According to some of the copyright notices filed with Reddit, simply posting an alleged pirate site homepage URL warranted a complaint, even when that URL didn’t link to any infringing content. We’ve seen the same kind of issues before, when copyright holders have made attempts to have site homepages delisted from Google, despite their content never appearing there. Further complicating the process is that the moderators of /r/piracy have no ability to respond to potentially false allegations. If a user makes a post that results in a copyright notice, only that user (or Reddit’s admins) are in a position to dispute the claim with the notice sender, so that rarely happens. Even if it does, nothing is made public. Meanwhile, the notices keep building up, despite best efforts and whether they’re valid or not. Even people simply posting names of releases are being flagged for copyright infringement, something that isn’t illegal in any form. As a result, those posts too are now being removed, as quickly as the mods can reach them. “I have begun unofficially removing release posts and it’s quite sad considering that a rather large bulk of our users look forward to them every day, I know I did,” moderator ‘dysgraphical‘ informs TF. It’s nothing less than self-censorship in response to sloppy and/or fraudulent claims, but these are testing times. But the really big issue here relates to the huge archive of posts already present on /r/piracy – some ten years’ worth of discussions. Is there anything in there that could warrant a surprise complaint? Apparently so, since rightsholders have been digging up issues from the past and complaining to Reddit. This left the moderators of /r/piracy with a huge dilemma. Uncertain of what lay in the archives and only being in a strong position to be absolutely certain of the state of play more recently, they asked the community for input on the ‘Nuclear Option‘ – deleting every post older than six months old, just to be sure. After the votes were counted, those in favor of deleting the archives outnumbered those asking for preservation by ten to one. All that was left was to find a way to begin deleting history, around 9.5 years of posts. A script was created and put into motion and the purge began. “Given the speed, this might take weeks,” says moderator ‘dbzer0’, a nine-year veteran of the sub-Reddit. It’s unclear when this sweeping process with be fully completed, but it’s hoped that it can keep the community alive. Not all of the moderators were in favor of the mass deletion since that, of course, deletes the community’s history too. “The Scrubbing [as the deletion process is now called] is just a poorly, rushed attempt to elongate the community’s lifespan on Reddit,” dysgraphical says. But the vote was cast and the final decision appears to have been a democratic one rooted in self-preservation. It does raise interesting points, however. The recently highlighted situation shows that sub-Reddits devoted to controversial topics – especially those related to piracy – are at risk of being targeted. When they are, the copyright notice and counter-notice process is somewhat undermined. While users can be banned for repeat infringements, it’s trivial to open a new account. And when the notices start to pile up on Reddit – legitimately or not – whole communities can be banned, despite working above and beyond the requirements of the law. “The issue at hand is not that r/Piracy distributes copyrighted content, but rather that the discussion of digital piracy is no longer protected; it never was,” dysgraphical adds. To give a school analogy, it appears that if a few kids misbehave, get misinterpreted, or targeted incompetently, the whole class gets kept behind after school – before being permanently expelled. It’s effectively mass punishment based on the acts of a few – or the whims of bots. Finally, subscriptions to /r/piracy have always been on the increase and are now edging towards 370,000 subscribers but the ongoing purge is having a clear effect on traffic to the sub-Reddit, when the two unusual peaks (including the April 1 surge) are discounted. Whether the popular forum can fight back from this decline will remain to be seen but it’s clear that deleting most of its history is already causing pain. The big question is whether Reddit’s admins are taking note of this huge olive branch or whether they’ll still choose to chop down the whole tree regardless. Will Reddit’s /r/Piracy Sub-Reddit Get Shut Down?